Virus • Psinergy Tech: We keep Computer Repair Simple. ALERT: Computer Repair Phone Scams on the Rise! Beware: Computer Repair Phone Scams Are On The Rise Again! We have been receiving calls from many customers about supposed computer repair companies targeting individuals to “help fix their computer”. They call you, often asking for you by name, then walk you through opening error logs and reports in an attempt to scare you into giving them remote, unfettered access to your system to fix your ‘problems’. As a rule of thumb, these are scams! Unless you are specifically paying someone to remotely monitor your system, no one should be calling you to let you know about errors or viruses on your computer. The prices for these ‘fixes’ generally range in price from $200 to $500, and instead of fixing your computer, they only damage your computer installing viruses, malware, or worse. To go into a bit more detail on how they scare consumers, I’ll list out some of their common tricks. They claim to be calling from Microsoft or some highly rated Microsoft Partner. Companies of this size do not have time to randomly call users to fix their computers. The people calling are not whom they claim to be and most of the time you are simply throwing away your money. They will have you open your Event Viewer to show you “all the errors your system has”. It is quite common to have some errors in your event viewer. While some are extremely critical to have repaired, most simply refer to timeouts or minor glitches in programs, and do not justify a major overhaul of your system, especially at the prices you are being quoted. 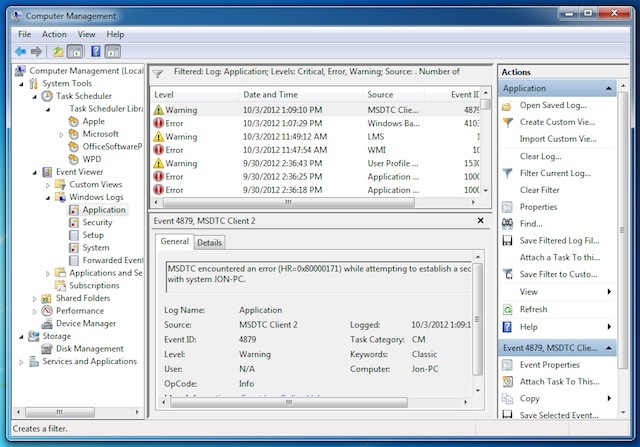 If there are serious errors, you will most likely have noticed them before opening your event viewer. Some of these scam calls have even gone so far as to state that these errors are viruses. They tell you to try and delete one of them and when that fails, claim you have viruses that can not be deleted and that you need their help. All of this leads to the grand finale (and most dangerous portion) of the call. They ask you to open a web browser and go to a specified address. When the site loads, most of them look extremely reputable. Guiding you to a link on one of their pages, they tell you to download and run a remote control utility, giving them full access to your computer so they can “fix it”.Why is the most dangerous portion? Once you have given them access, they are able to do just about anything they want, including installing their own viruses, spyware, trojans, etc. These can be extremely harmful if you ever use your computer to check credit card balances, pay bills, log in to your bank account, etc. If they have installed a keylogger program, they now have your usernames and passwords to all of these sites. The safest thing is to simply hang up on them. If your are feeling adventurous, try to get as much info from them as you can, including a number where you can call them back. This information could then be given to the proper authorities, such as the Federal Trade Commission, the Federal Communication Commission, or even your state’s Attorney General or local police. If you have already received one of these calls and have given them access, shut down your computer and get a reputable, qualified technician to take a look at it. You should also consider changing all your passwords from a secure computer. If you notice any transactions on accounts that you did not make, immediately report them your bank or appropriate financial institution. Never, I repeat, Never give someone you do not know and trust remote access into your computer. The Busy Computer Seasons: a Virus Writer’s dream!